Italy's earthquake zone, here in its central mountainous spine, is both beautiful and precarious. Ancient hilltop villages dot the mountain ridges. It is an area popular with Italians coming to escape the summer heat. The historic stone towns are perched up high. To reach them you climb narrow, winding roads, and squeeze through tight old streets. These are places full of proud old homes and ancient churches. But beneath them sits a geological fault-line. Since the earthquake, the aftershocks have kept coming. Sometimes they are small, the ground under your feet shaking a little for a second or two. A few have been much larger, a perceptible rocking that lasts longer, then subsides. With each new shock people freeze and wait, anxious - hoping the movements don't presage something bigger. Several of these small tremors came while we stood with the rescue teams digging through the rubble of Pescara del Tronto. Roberto Bartola, a cave rescue specialist covered from head to toe in dust, paused from his digging and told me one building went down while he worked. "It was like that one," he said, pointing to a two-storey house still standing, but with its front sheared off. "I had been inside, but I'd left, then it fell." Pescara del Tronto was a tiny, historic place. A small, tight grouping of old stone and wood houses perched above a valley. It had a permanent population of little more than 100. "The problem now," Roberto Bartola told me, "is nobody knows how many people are buried here." Some have holiday homes, others simply come for the summer to stay in this village. But nobody is sure how many people were here at the time of the quake. Pescara del Tronto had been built up high, clinging to a steep slope hundreds of years ago because, in the Middle Ages, its location provided safety, a fortified refuge from bandits in the valleys below. But its ancient construction and location were its undoing when the earthquake hit. The beautiful old houses crumbled, and then collapsed down the hill on top of each other. Now all that was left were vast mounds of huge rocks, dust, splintered wooden beams and crushed furniture clinging precariously to the slope. 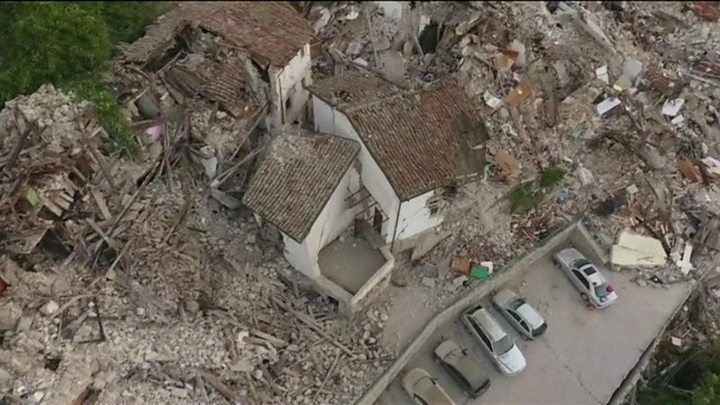 At any moment a big aftershock could have buried all the rescuers here if the houses had slipped further down the hillside. Two lines of men were heaving huge stones by hand, passing them from one to another, then rolling them down the hill. They were trying to dig down, as the sniffer dogs had found signs of life in the ruins. At the end of the line of men was Marco Pelatroni, bare-chested and sweating in the heat. He lives down the valley and, asleep at home, had woken when the earthquake struck. "I saw my mother screaming, my father the same," he said. "After two minutes we went out of the house and into the car, like everyone in our city. We drove to a big park, with no buildings around and stayed there all night," he told me. Marco and his friends, all members of a local rugby team, had come immediately to Pescara del Tronto to help search for survivors. Looking at the devastation, he shook his head. "It'll be a miracle if we find anyone alive here," he said. In a hole beneath him, two firemen had burrowed deep into the rubble looking for a survivor. They were in a tiny space under the stones. "It's a dog," one of them shouted out. For half an hour the men kept digging. They passed water down to be given to the animal. And eventually they worked it free, then emerged, carrying it to the surface. There was a ripple of congratulations through the crowd. "It doesn't matter to us if it's a person or an animal, we save it," said Gianni Macerata, the fire officer in charge of his team here. Then he raised his hand and called for silence. A listening probe and a camera were dropped further into the rubble, looking for signs of life. So the digging goes on. But so little is left of Pescara del Tronto it is unlikely that more survivors will be found here. It seems unlikely too that this ancient little place, that has stood for centuries, can ever be rebuilt. Hundreds of years of history ended in an instant.